Hello on this humid Friday morning in NY. My hands have been well at work and things are moving along quickly. Collectors are happy and I am happy to be freeing all of these images I have had locked away in my mind for over a year. It was getting pretty crowded in there!! 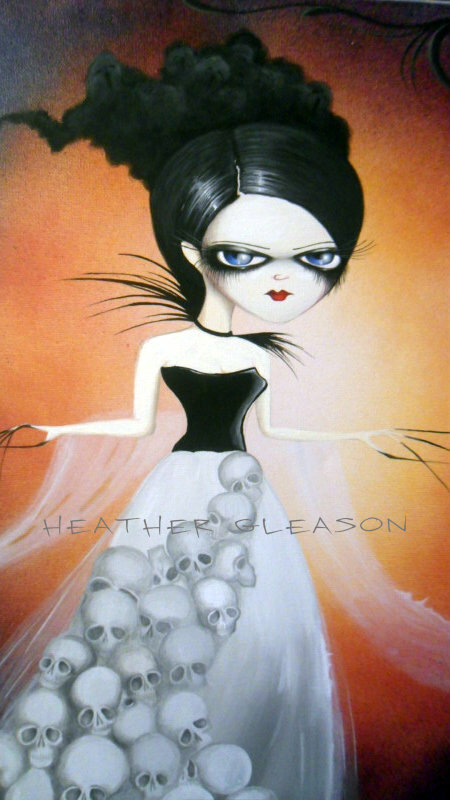 I have also been working on some more gothic pieces “DARK GIRLIE” pieces. “Madame Morte” my latest creation is Beautiful and strange. She wears a long Skull Skirt and a Lost Soul Shall around her arms. Her hair look closely has screaming faces dying to get out. Pretty creepy when you really stare into it but beautiful all around. Be sure and check out my newest offerings on Ebay and etsy.